The Foxwoods World Poker Finals starts today and runs through November 13th. 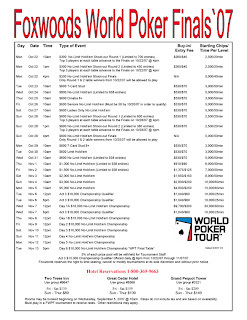 For those of you that are big poker fans, this could be your ticket to $$$. I know a fair number of folks that use poker to supplement their incomes - I'd do it too, except I'm not a big fan of gambling. As my friends who play online always say. If you play blackjack, you're playing against the casino and the odds aren't in your favor. If you're playing online at 3am, you're playing against drunks and stupid people, and it's easy to take their money. I can't attest to this personally, but my friends seem to make decent money. Well, it's time to leave the computer at home and head down to CT and interact with some people face-to-face. Put on your googley eyeglasses and crazy hats and what ever else you learned from watching the World Series of Poker on TV and hop in the car. 0 Response to "Foxwoods World Poker Finals - 10/22"